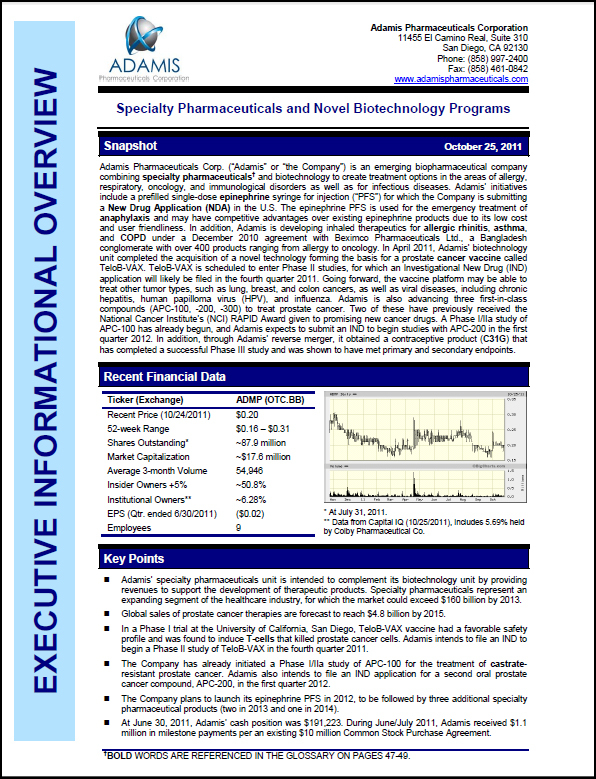 Adamis Pharmaceuticals Corp. ("Adamis" or "the Company") is an emerging biopharmaceutical company combining specialty pharmaceuticals and biotechnology to create treatment options in the areas of allergy, respiratory, oncology, and immunological disorders as well as for infectious diseases. Adamis' initiatives include a prefilled single-dose epinephrine syringe for injection ("PFS") for which the Company is submitting a New Drug Application (NDA) in the U.S. The epinephrine PFS is used for the emergency treatment of anaphylaxis and may have competitive advantages over existing epinephrine products due to its low cost and user friendliness. In addition, Adamis is developing inhaled therapeutics for allergic rhinitis, asthma, and COPD under a December 2010 agreement with Beximco Pharmaceuticals Ltd., a Bangladesh conglomerate with over 400 products ranging from allergy to oncology. In April 2011, Adamis' biotechnology unit completed the acquisition of a novel technology forming the basis for a prostate cancer vaccine called TeloB-VAX. TeloB-VAX is scheduled to enter Phase II studies, for which an Investigational New Drug (IND) application will likely be filed in the fourth quarter 2011. Going forward, the vaccine platform may be able to treat other tumor types, such as lung, breast, and colon cancers, as well as viral diseases, including chronic hepatitis, human papilloma virus (HPV), and influenza. Adamis is also advancing three first-in-class compounds (APC-100, -200, -300) to treat prostate cancer. Two of these have previously received the National Cancer Institute's (NCI) RAPID Award given to promising new cancer drugs. A Phase I/IIa study of APC-100 has already begun, and Adamis expects to submit an IND to begin studies with APC-200 in the first quarter 2012. In addition, through Adamis' reverse merger, it obtained a contraceptive product (C31G) that has completed a successful Phase III study and was shown to have met primary and secondary endpoints. * The Corporate Snapshot was last updated on October 25, 2011.